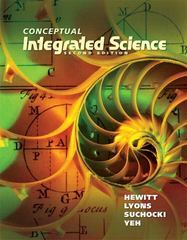 Conceptual Integrated Science 2 Edition This best-selling introduction to the physical and life sciences emphasizes concepts over computation and treats equations as a guide to thinking so the reader can connect ideas. Conceptual Integrated Science covers physics, chemistry, earth science, astronomy, and biology at a level appropriate for non-science students. The conceptual approach relates science to everyday life, is personal and direct, deemphasizes jargon, and emphasizes central ideas. The conceptual ideas serve as the foundation supporting and integrating all the sciences.